The Arkansas Razorbacks roll into town after suffering one of the worst losses in their program’s history: a 44-17 loss to North Texas. It wasn’t as bad as Jack Crowe’s Razorbacks losing to the Citadel in the first game of 1992, but it wasn’t far off. What we have here is a complete overhaul of a program, left in semi-shambles by Bret Bielema. Couple that with a new offense, a new philosophy, and you are going to have a year like Arkansas is having so far. The problem, though, is that it doesn’t seem to be getting better at all. It’s actually getting worse. The Razorbacks started with a 35-point win over Eastern Illinois. Great, right? Nope. Then they went to Colorado State, led at halftime, and fell apart in the 4th quarter against a MWC opponent. And then North Texas faked a fair catch and ran all over Arkansas. You’d think Colorado State would be a wake up call, but sometimes a wake up call isn’t enough. If you have a bunch of quarterbacks recruited to go all pro-style and hand the ball off behind a bunch of hawgs, and then you tell those same players to run a hurry-up, it’s probably not going to go well for a while. Throw in a few guys that will just never latch on to the guy that isn’t the guy that recruited them, and you have a recipe for disaster. So while Head Coach Chad Morris has proven that he and his version of Gus Malzahn’s offense can win, it’s going to take time in a place like Arkansas, especially with what was leftover after Bret. Auburn is also coming off a loss, one that was equally deflating, but on the completely opposite end of the spectrum. Arkansas was blown out by a team that should be on a completely lower level. Auburn lost to a team they are better than in the most helpless of ways: a last second field goal. 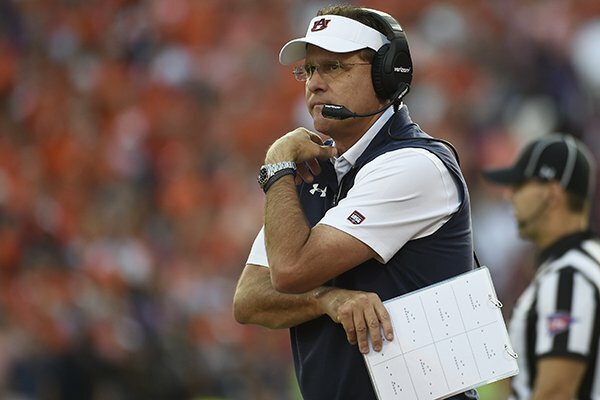 Many Auburn fans have taken a one point loss to a Top 10 team like a 24-point loss to North Texas. While it’s easy to see the difference for most, those that are off their rocker should understand that the major difference between these teams though is stability and talent. Auburn’s offense hasn’t totally clicked this season, but this seems like the game to get that fixed. While losses are just plain terrible, when it isn’t a terrible loss, it almost takes some pressure off. Auburn lost to LSU last season and was one game from the Playoffs. So when you have a team like Arkansas that has appeared to all but give up, that should mean that Auburn can fix it’s problems (heading into another winnable game next week with Southern Miss), and right the ship. As I say that I’m still thinking about the fact that Auburn has a Top 10 win and a one-point Top 10 loss. Some can’t separate being mad that Auburn lost a game they could’ve won and being mad that Auburn is a bad football team. One of those is true and it’s obvious which one it is. Auburn will use this game to clean up offensive issues, specifically shuffling the offensive line to figure out a way to give Stidham a chance to throw the ball deep. Auburn will use this game to take off the sting from last week. Auburn will use this game to remind everyone that they are one of the best teams in the nation. Stidham plays three quarters after throwing three touchdown passes, each running back scores a touchdown, the defense suffocates Arkansas’s offense, and Gus goes a little easy on his friend.